All seams are 1/4". 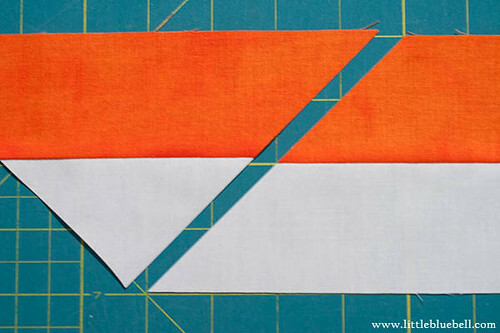 Strips are cut along the width of fabric, approximately 42" wide. 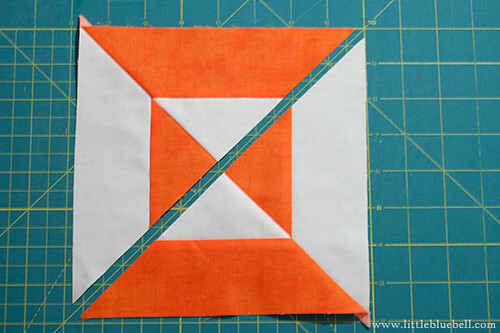 One strip set will make two Double Hourglass blocks. 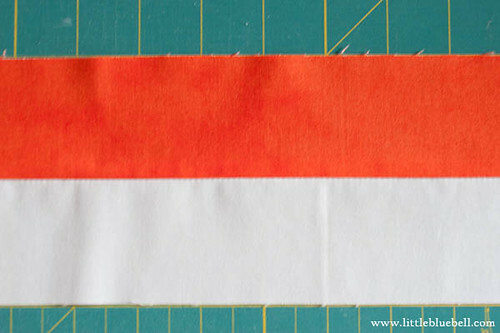 STEP 1: Place two strips right sides together, and sew along the long side. Press. I recommend pressing to the side instead of open for this block. It really helps your points line up. STEP 2: Find the 45 degree line on your ruler. Place it along the bottom edge of your strip set. 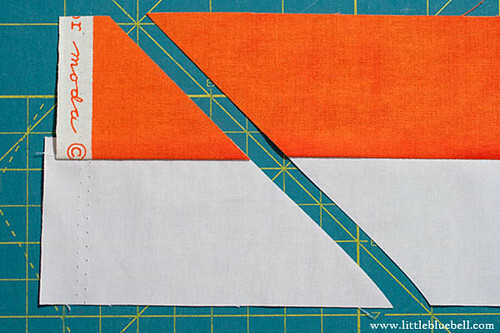 Look at the top of your strip set and make sure that the ruler is just past the selvage. STEP 3: Holding your ruler firmly, make your first cut. STEP 4: Line up the 45 degree line along the top of your strip set. Make sure it's nice and straight along the length. Line up the bottom of the strip set with the very edge of your ruler. 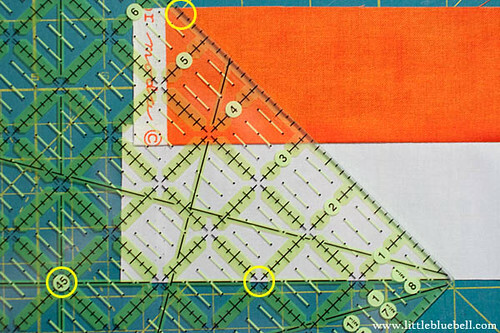 This is the tip of your triangle so take your time to place your ruler just right. STEP 5: Make your second cut. Now you have a triangle! 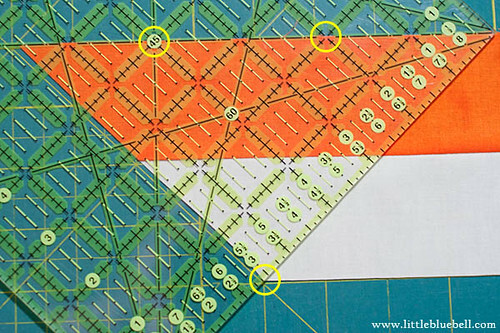 STEP 6: Now line up the 45 degree line along the bottom of your strip set. The top of the strip set should just touch the edge of the ruler. This is the tip of your triangle. Cut carefully. 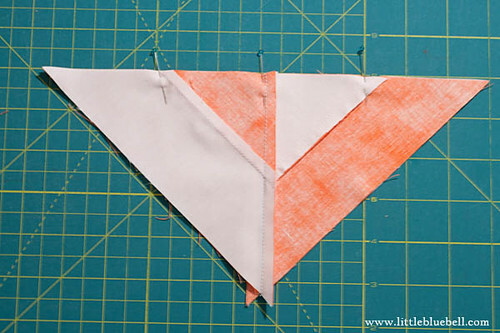 Continue down your strip set, repeating steps 3-5 until you have cut eight triangles. STEP 7: Arrange in the layout shown. 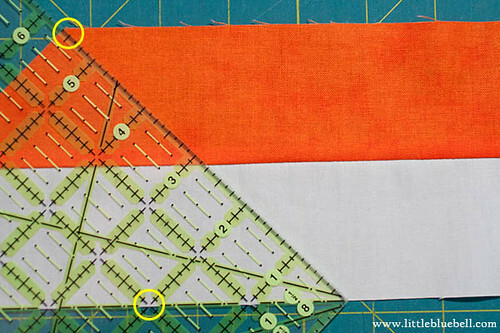 STEP 8: Pair up the triangles and sew them together using a 1/4" seam. STEP 9: Pin and sew together as shown. 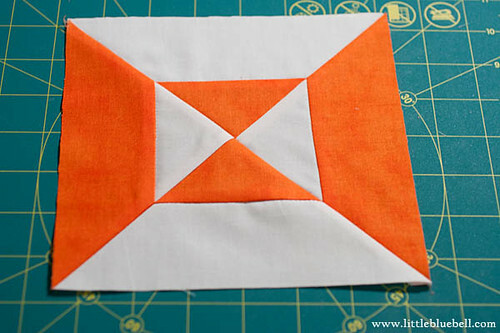 STEP 10: Trim your block to 7" square. This looks great! Going to try it when the kids take a nap today! Thanks! I pinned this, looks so simple! Thanks for the great tutorial. This block has been on my list for a while. Thanks Adrianne - how simple you made it look! 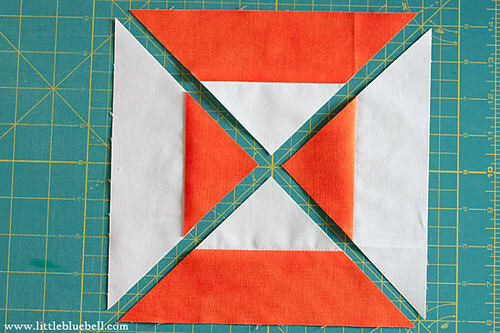 Thanks for sharing- I'm so busy right now that quilting seems to have fallen off my list! But thanks for the inspiration anyway! This is really very simple :) Thanks for the lovely tute. Thanks for the great tutorial for a very versatile block Adrianne! Nicely done Adrianne - thanks! Cool, thanks for the tute! Many thanks for the tutorial! THANK YOU!!! I am adding this to my list of quilt blocks to make this year! I appreciate you sharing it!!! you made that look sooooo easy! I'm definitely going to try it! What a fabulous way to make these blocks, thank you!! Looks nice and easy! Thanks. This is a fantastic tip!! Wow, thanks for sharing. What a great tutorial. I can honestly say I have never seen this one before done this way. Thank you so much. I'd like to make this block for a quilt block swap. It has to be 12 1/2 inches square. What size is your block? Thanks for creating it! It's really cute!! Great question! Let me do some figuring and I will get right back to you.